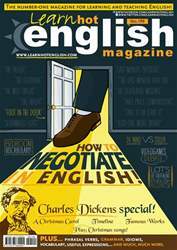 Digital Subscriptions > Learn Hot English > 199 > What the Dickens! Carol. Expectations. books by Charles Dickens – one of the most famous and popular novelists of all time. Dickens is famous for his vivid stories and colourful characters. But how did he come up with all the ideas? The answer lies in Dickens’ own life, which was almost as eventful as some of his characters’. Charles on 7th February 1812. His early life was comfortable and secure until his father (John Dickens) suddenly went bankrupt. John was sent to Marshalsea debtors’prison where his family joined him shortly afterwards. Dickens used his experiences of this to help write the book Little Dorrit. While his father was in prison, Dickens had to work in a rat-infested factory for ten hours a day. His job consisted of pastinglabels on jars of shoe polish. He earned six shillings a week (about 30 pence) and had to give all of the money to his family to help pay for their accommodation. This experience of poverty inluenced much of his writing and helped him describe the conditions in which many poor people spent their whole lives. When it was published in 1839, Oliver Twist shocked readers with its images of poverty and sufering in London.